The scenario of hackers targeting another hacker has became a very common matter, in last two years we have seen many instances of the above matter where a hacker hit another hacker's site, community, blog, forums and so on. Today the story which I will about to discuss is the same matter where infamous hacker community named 'Anonymous' fallen victim. A newly formed hacker group calling them selves "Rustle League" targeted one of the officially recognized twitter account (@Anon_Central) belongs to hacktivist group which have more than 160,000 followers. According to security experts "the reason Anonymous fell victim is probably human weakness." Or in other word many of twitter accounts get hacked due to choosing week passwords. "Chances are that they followed poor password practices, like using the same password in multiple places or choosing a password that was easy to crack. Everyone should learn better password security from incidents like this - if it can happen to an account run by Anonymous supporters, it could happen to you" said another expert of security firm Sophos. The hack on Anonymous twitter account placed Thursday morning and three hours later, those running the feed tweeted that they had gained back control of their account. 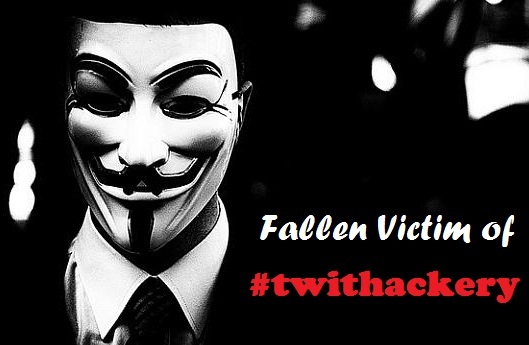 While talking about attack on Twitter, we would like to remind you that, in this month a sophisticated cyber attack compromised the security system of the social networking giant twitter, where more than 250,000 twitter users have fallen victim. Though the hack of Anonymous twitter account does not resembles to the said matter, but the hack can be considered in the list of twitter hacking, widely known as #twithackery; where hackers gain temporary access of celebrity and famous twitter accounts. If you did the history we will find the following names, WWE champion John Cena, Star Rita Ora, Justin Bieber, Teyana Taylor,American pop singer Kesha, NBC News, Fox News Politics, USAToday, Lady Gaga’s Twitter Account, Anders Breivik, Mahesh Bhatt, Huffington Post; these are the famous names who have fallen victim to twithackery.